The Hotel Indigo Hong Kong offers modern, stylish rooms with Chinese flair and great views, leaving no doubt that you are in the heart of Hong Kong. The Wan Chai neighborhood is vibrant and you are close to a lot of the things Hong Kong has to offer. Add good service and elite treatment and I’ve found a new, favorite hotel to stay in Hong Kong. I recommend it for your visit to Hong Kong Island and wouldn’t hesitate to stay again. 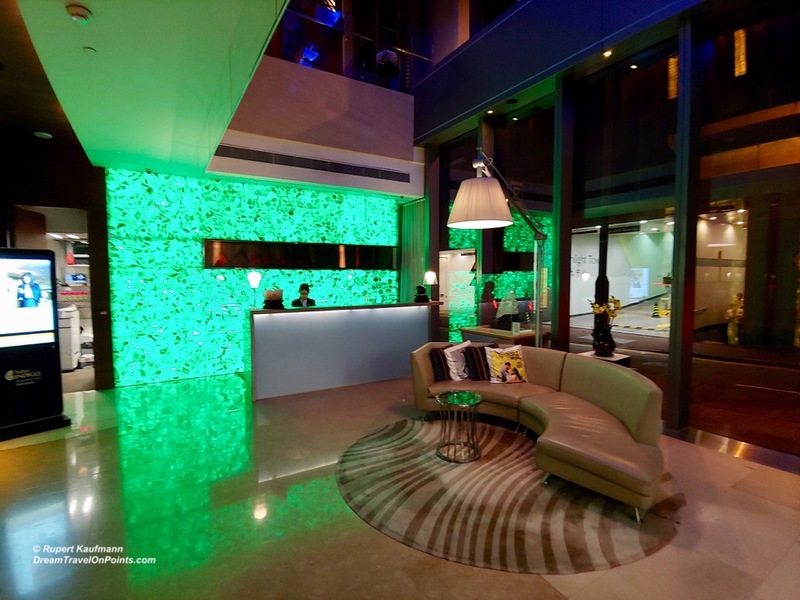 Location: Hotel Indigo Hong Kong is located on Hong Kong island in Wan Chai. The neighborhood offers lots of small, independent restaurants and bars. It’s a 5 minute walk from the Wan Chai MRT station and the road leads through a lively, local market. The neighborhoods of Central and Causeway Bay are just 1-2 subway stops away. Hotel Indigo is about 1h from the airport by airport express train or 40 minutes by taxi. It was easy to get a taxi near the hotel during our stay, as pretty much anywhere in the central parts of Hong Kong island. 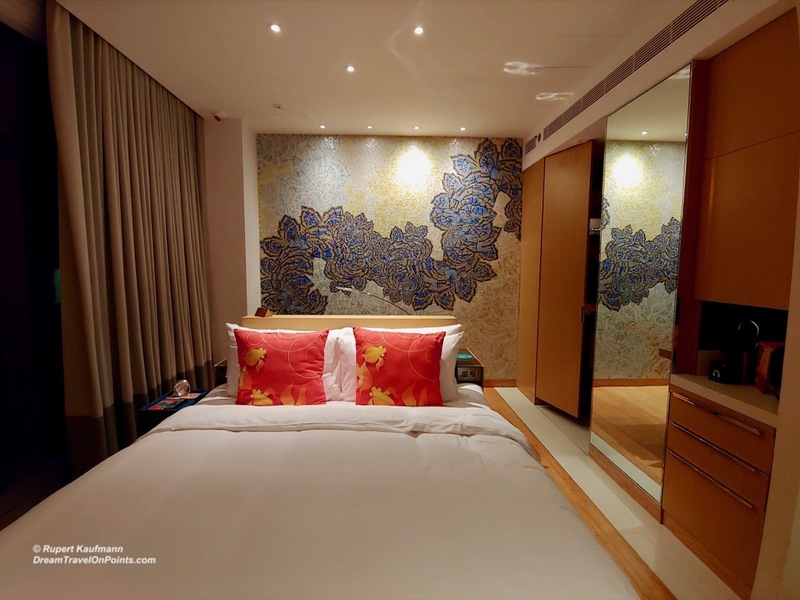 Hotel Indigo Hong Kong has a great location – it’s easy to get around Hong Kong to see the sights, find great restaurants in walking distance and Wan Chai has a cosmopolitan crowd but retains a local, edgy feel to it, making it a fun place to stay! You can check out my Hong Kong map for a better idea of the Hotel Indigo neighborhood! 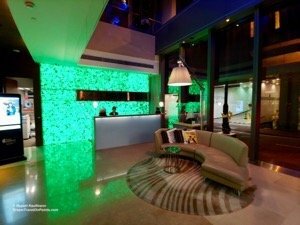 Service: I had reached out to the Hotel Indigo prior to arrival by email to link two separate free-night-certificate reservations and describe our preferred room. Upon arrival at the front desk, staff was well aware of our request, had linked the reservations and assigned a quiet, high-floor room. The check-in was processed quickly and we received all the required hotel information. The front desk handled the check-out just as politely and professionally. Housekeeping was also on top of their task and cleaned our room thoroughly and quickly each day, replacing towels, toiletries and coffee as appropriate. The staff at the gym and pool was especially attentive, offering towels and water and proactively turning on the jacuzzi (twice) when they noticed that we were checking it out. Staff at the rooftop bar was professional as well. 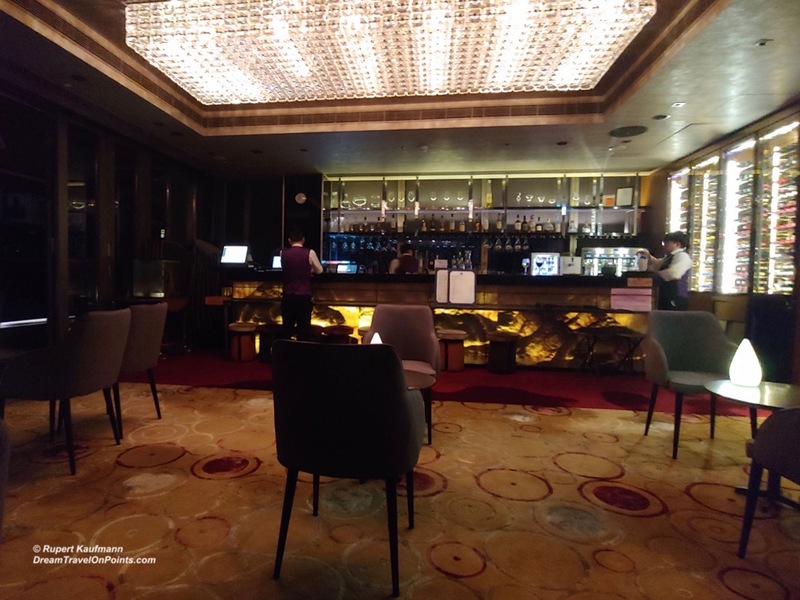 Overall, I’d consider the service at the Hotel Indigo Hong Kong better than expected for an upscale hotel in Hong Kong and they made our stay a pleasant one! Room: We had a Deluxe Corner King room for our stay and it’s a great choice for a stay at Hotel Indigo. 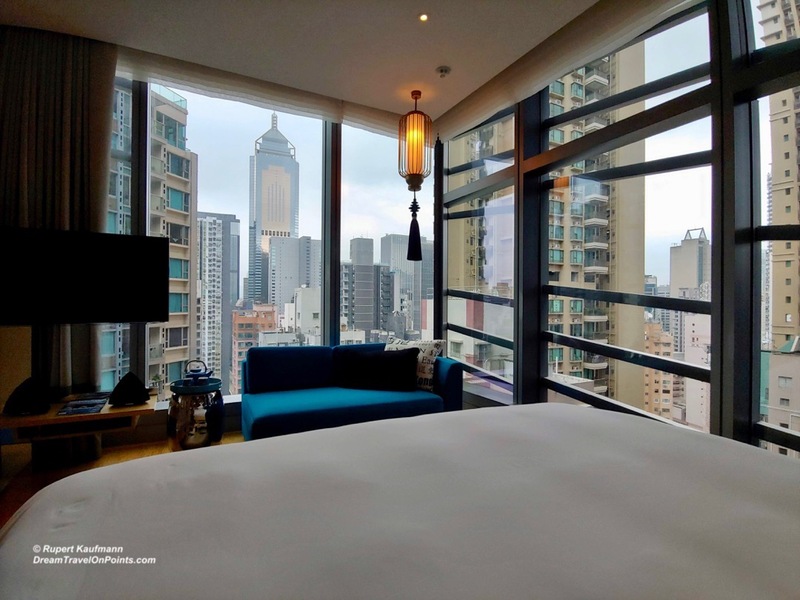 The rooms are modern, stylish and offer great views, leaving no doubt that you are in the heart of Hong Kong. The views are stunning during the day, offering a view of the surrounding high-rise buildings as well as down on to the local market lining the street, as well as at night with a sea of lights all around! 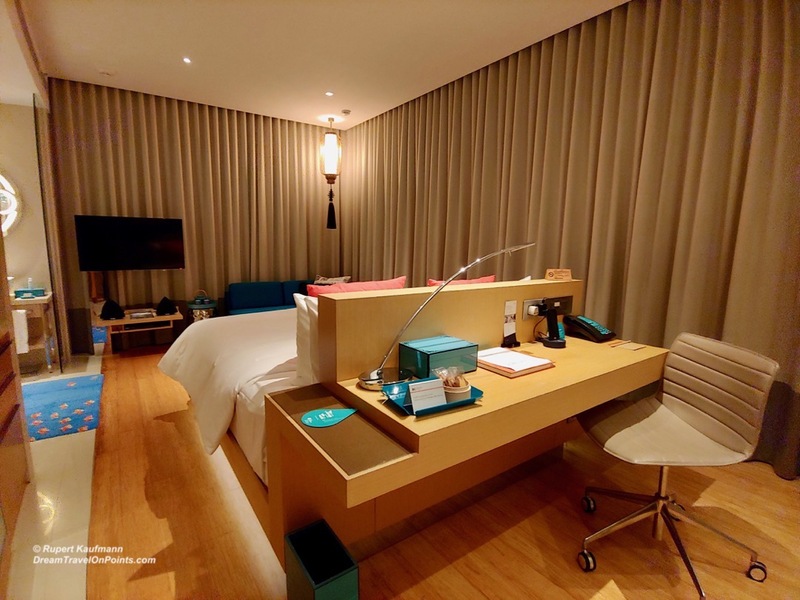 The room is compact, but well designed, with the king-bed facing the windows. Behind the bed is a narrow side-board/desk with a chair to get some work done, in a pinch. 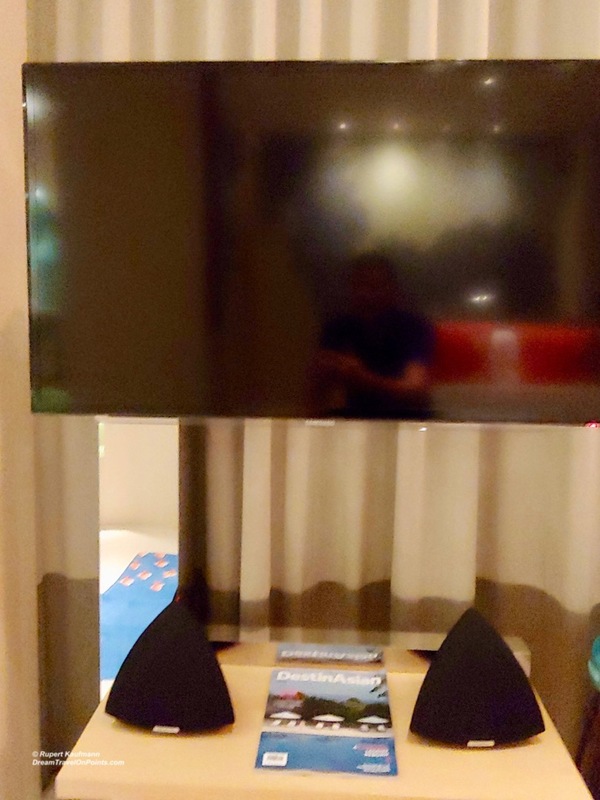 To the side, in front of the bed, is the entertainment center with a large, flat-screen TV and high-end bluetooth speakers to connect your personal music. In front of the windows are a small sofa and a drum-like table with a Chinese tea set. A lantern hung in the corner provides a local touch of decor that contrasts nicely with the modern feel. The wall behind the bed is covered by a stunning mosaic as the center piece of the room decor. To the side you’ll find the bar cabinet with a mini-bar, glassware, a nespresso coffee maker and a tea kettle. The small closet has a laptop-size safe, bathrobes and an iron/ironboard. The bathroom is an open concept, with the vanity in the room. 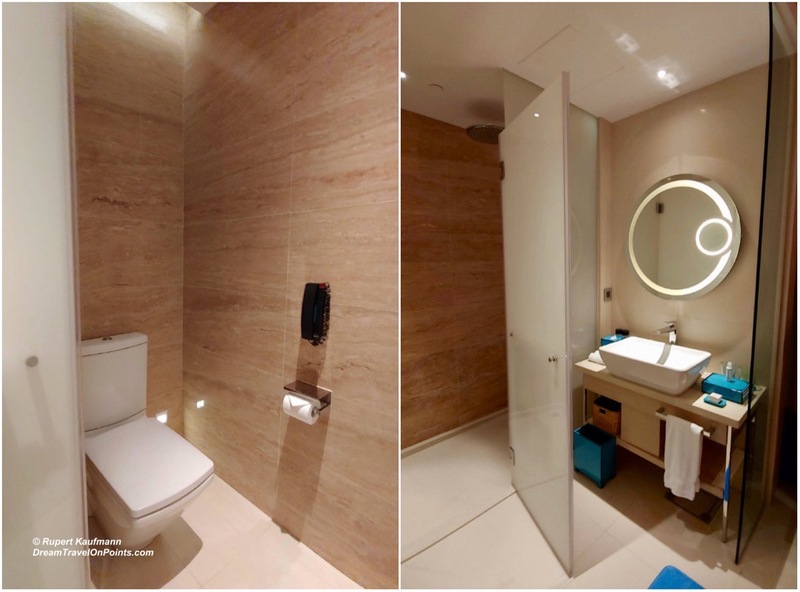 Behind it are two cubicles separated with frosted glass doors, one for a walk-in shower, one for a toilet. The shower has a hand-held, wall mounted shower head as well as a rainfall shower head. The toilet, surprisingly, doesn’t offer a bidet function. The vanity has a well-lit mirror, with a small, enlarging shaving mirror embedded. You’ll also find a salon-style hair dryer. The toiletries provided are Crabtree Jojoba oil, which we liked a lot, much better than the standard Crabtree. The Indigo brand promises a unique decor for each hotel that reflects its location and the culture of its neighborhood. The Hotel Indigo Hong Kong does a great job with that, incorporating modern Chinese decor elements for a modern, stylish, yet uniquely Hong Kong feel! It’s one of my favorite rooms in the city! 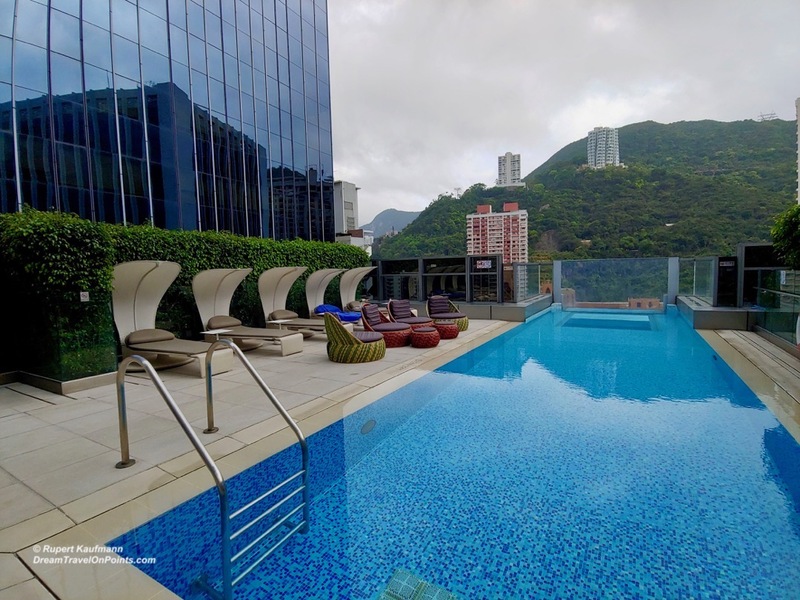 Restaurant & Amenities: The Hotel Indigo Hong Kong has a rooftop bar that offers indoor and outdoor seating. We had our welcome drinks at the bar and it’s one of the nicer hotel bars and worth a visit. We didn’t try the hotel restaurant or small coffee shop during our stay – there are just too many great restaurants around the hotel! The Indigo has a small gym with cardio and weight equipment for a basic workout. 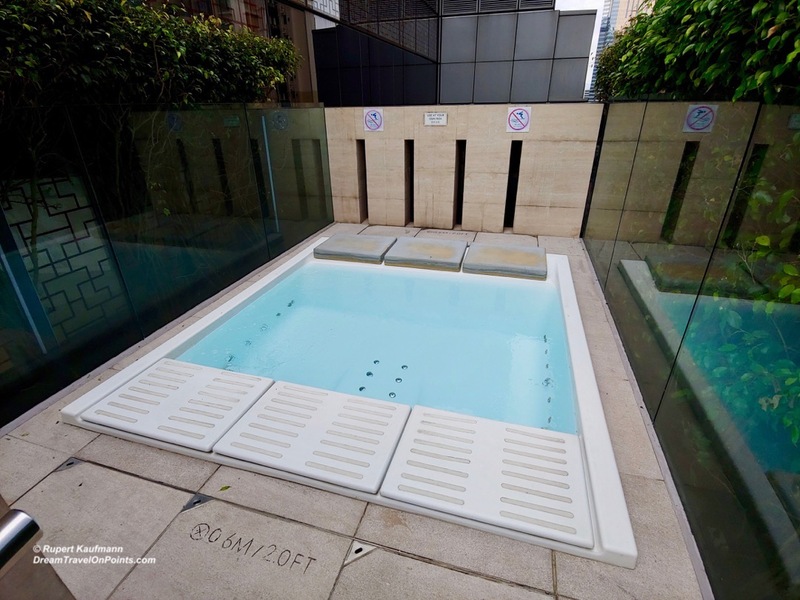 You’ll find a rooftop, outdoor pool with comfortable loungers and some chairs. There is also a small jacuzzi with some greenery for privacy. It has very strong jets and massage jets for your back, making it a nice addition. It’s not heated, so the water is refreshing on a hot day, but was unpleasant during the cool weather of our visit and I didn’t last very long. Value & Rewards: We used two free-night certificates from our IHG Rewards Club Chase credit card for our stay. The current reward price is 45,000 points/night and will not be available on free-night certificates in the future. The cash price during our stay was $245, making this an ok certificate value. Hotel prices in Hong Kong are pretty steep and I consider this reasonable value. You can find the current price here! We were recognized as IHG Rewards Club Platinum members on arrival and received a welcome drink voucher for the bar, including soft drinks, wine, beer and select cocktails. A welcome amenity of cookies was awaiting us in our room. We had booked one night in a Superior Room and one night in a Deluxe Corner room and were “upgraded” to a Deluxe room for both nights – I’d consider it a partial upgrade, but was very happy with it as it is a very nice room indeed and IHG does not promise upgrades on reward nights. We were offered a late check-out without prompting, but didn’t need it due to an early flight. 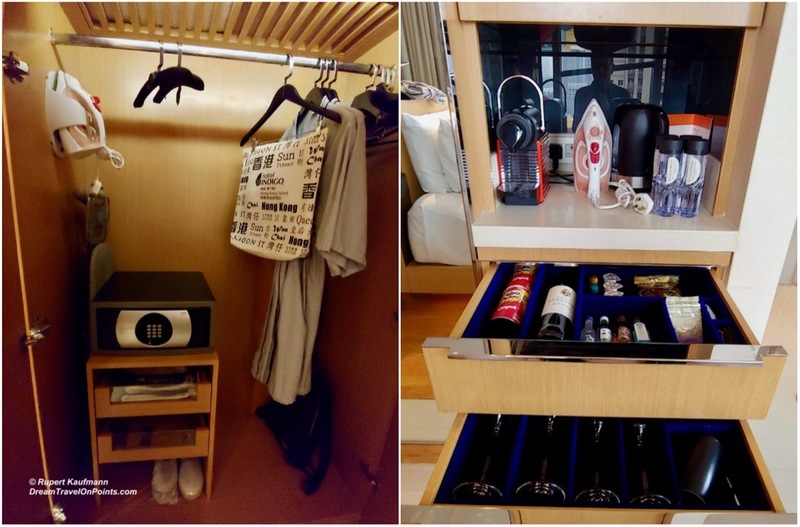 The Indigo Hong Kong went beyond the IHG Reward program requirements and I consider this very good elite treatment. 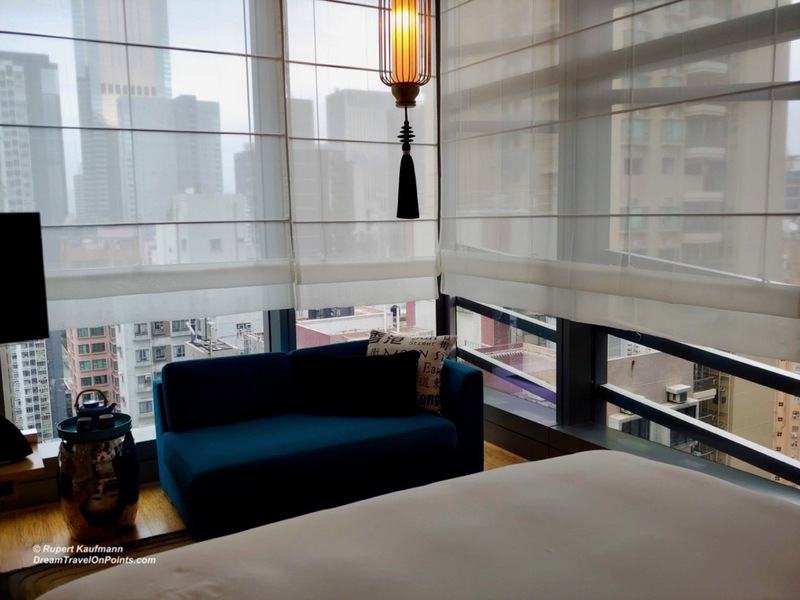 Bottomline: The Hotel Indigo Hong Kong offers modern, stylish rooms with Chinese flair and great views, leaving no doubt that you are in the heart of Hong Kong. The Wan Chai neighborhood is vibrant and you are close to a lot of the things Hong Kong has to offer. 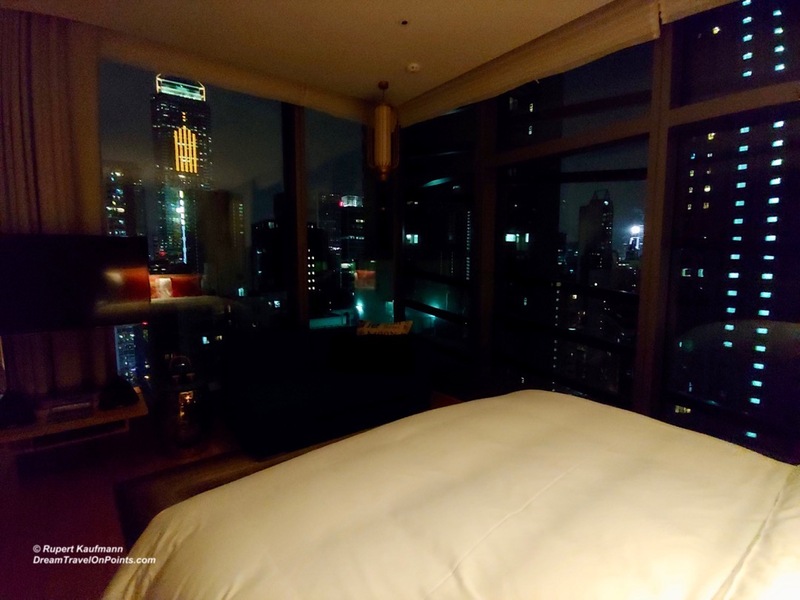 Add good service and elite treatment and I’ve found a new, favorite hotel to stay in Hong Kong. I recommend it for your visit to Hong Kong Island and wouldn’t hesitate to stay again.